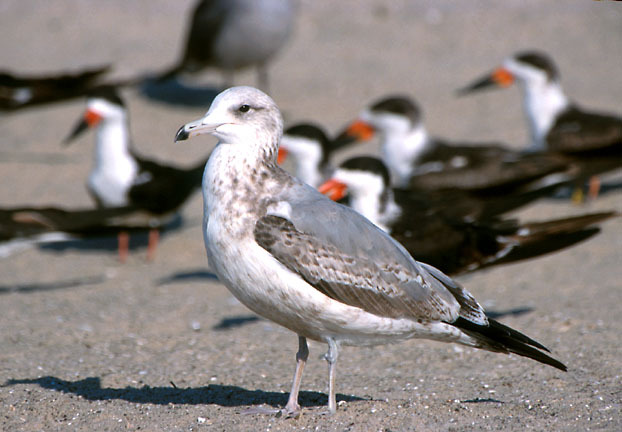 a beginner's guide to aging gulls The gulls covered by this website are all either "four-year gulls" or "three-year gulls", meaning that they mature and reach adulthood in three or four years. The three-year gulls are the smaller ones: Mew, Kamchatka, Common, Ring-billed, and Black-tailed. 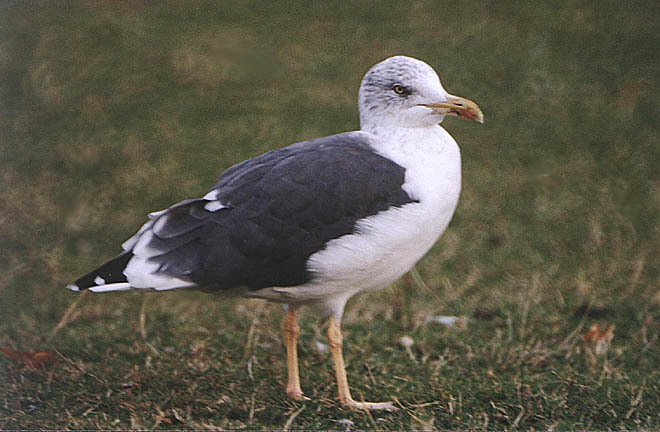 Yellow-footed is a large gull, but is also a three-year gull; and Baltic has recently been thought to be a three-year gull as well. All the others are four-year gulls. The following examples serve as a crude guide to aging these birds. Most of them go through a complete moult in the late summer or fall, from summer into winter plumage, and a partial moult (not including flight feathers and tail) in the spring, from winter into summer plumage. Thus, winter plumaged birds have fresh flight and tail feathers. Spring and summer birds can appear rather worn and tattered. Note the crisp scalloped upperparts, all black bill, and overall brown plumage, typical of most species. Gulls typically moult from juvenile to first summer beginning in the winter of their first year, when they are less than half a year old. This is sometimes referred to as "first winter". The only real change here from the juvenile above is the back and scapulars have been replaced by feathers that have bits of "adult gray" in them. Note that the wing coverts are still the juvenile feathers, but appear more worn and faded brown now. The bill has also acquired its typical first year look. 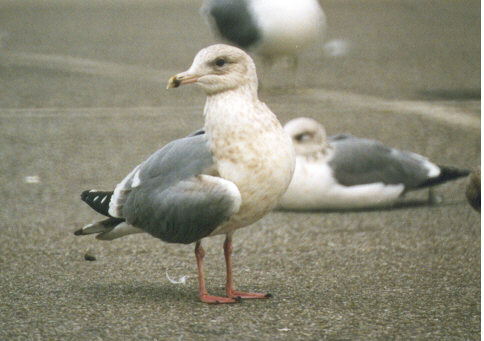 On all first year gulls, the tail will be some variation of dark and white with dark barring. Now the bird has mostly adult gray back and scapulars, with some bits of gray among the brown wing coverts as well. 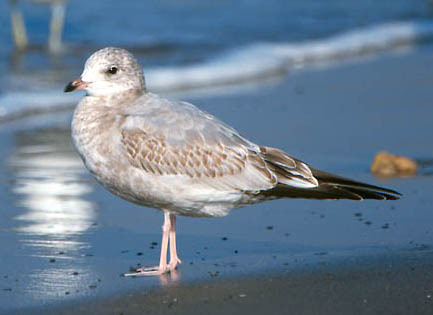 The wavy marbling on the greater coverts and tertials is typical in second year plumage of four-year gulls. They eyes and legs may or may not resemble the adult color. The bill color is highly variable. The tail will often have substantial black areas with variable marbling and white areas at the base. Suddenly the bird looks more or less like an adult, except it still has some substantial black in the bill, some flecks of brown on the wings, probably an incomplete primary pattern (not visible), and a mostly white tail with a variable and often broken tail band (not visible). Most adult species are streaky-headed in winter, all white in summer. Many species will show some black on the bill next to the red gonydeal spot in the winter only. The legs and bill often become brighter in the summer. The tail will be all white. Three-year gulls start off one year ahead of four-year gulls. First winter looks like second winter of four-year gulls, second winter looks like third, and third winter is adult. There is one important difference, however, which is shown in this image. A first winter three-year gull has the adult gray back and scapulars of a second winter four-year gull, except it does not have the wavy marbling on the greater coverts and tertials of those second winter four-year gulls. 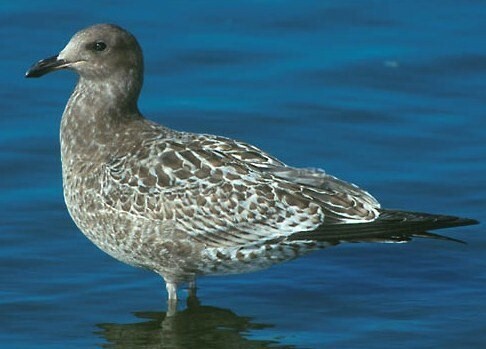 Instead, its greater coverts and tertials resemble those of the juvenile four-year gulls shown above. 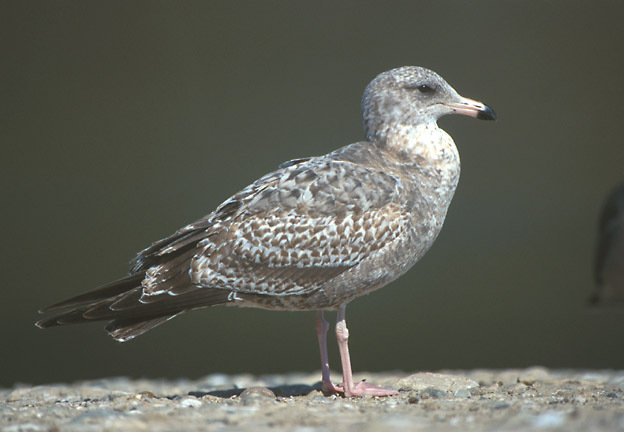 Also, its tail will be in the first year pattern with some kind of dark tail band and perhaps some barring, and the bill, eyes, and legs will adhere to the first year pattern, and will not vary between young and adult coloration (as do second winter four-year gulls).